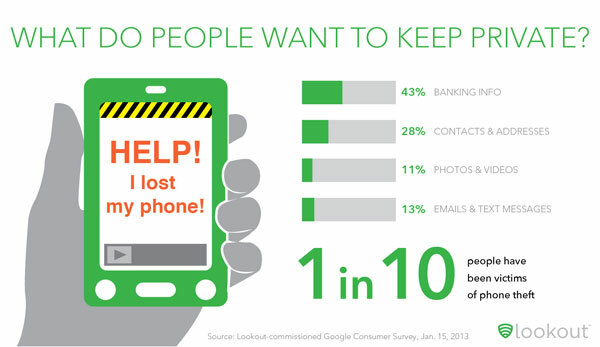 A recent Google Consumer Survey commissioned by Lookout, a mobile security company, found that one in three people have looked at another person's phone without their permission. 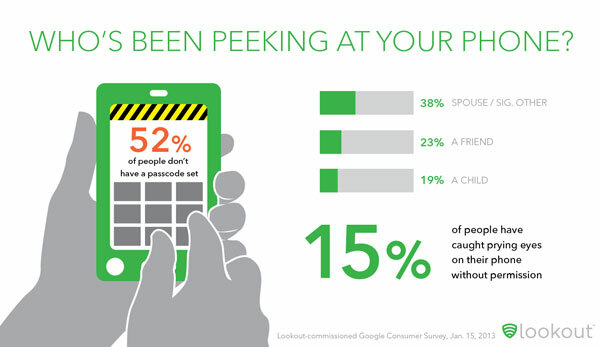 Of those admitted peepers, 40 percent checked out their spouse or significant other’s phone and 10 percent browsed a co-worker’s phone. The easiest way to prevent someone from spying on your phone is to put a passcode on your phone and use your phone's recovery app to locate your phone and wipe the data if your phone is stolen. But what if you just want to find out if someone’s been snooping? There are apps for that too and, not surprisingly, Lookout has one. The company’s Lookout Security & Antivirus for Android (free on Google Play) was just updated with new free feature called Lock Cam. If someone enters the lock screen password incorrectly three times, Lock Cam silently takes a picture and emails it to you, along with the device’s location. The standalone app GotYa! Face trap! ($1.99 on Google Play) provides the same functionality with a few bells and whistles. The app can be controlled from another phone via text message—even turned on, if you’re like me and have kids who are constantly trying to unlock your phone. You also have more control over how many failed log-in attempts are permitted before it starts taking photos and tracking location. For iOS device owners, the available option for whole phone access isn’t quite as robust. You can go with Best Phone Security Pro ($0.99 in iTunes) if you’re looking to trap a peeper. You have to set the alarm each time and the apps is motion sensitive, so you’ll trigger the alarm when you pick up the phone as well. Inputting the correct passcode will deactivate the alarm and the app will only capture a photo and location information if the passcode is input incorrectly. Otherwise, consider an app like NQ Vault (free on iTunes and Google Play), which locks up your photos, videos and messages. For iOS devices, a $0.99 in-app purchase of Break-In Monitor will let you set the app to capture a photo of anyone who enters an incorrect passcode. For Android, you’ll need to subscribe to the premium version for $2.99 per month for Break-In Monitor, a hidden Vault for your files and cloud-based secure file backup. Very good listing - thank you! I also highly recommend Cerberus. It’s very reasonably priced - a one-time payment of €2.99 (as of now, just over $4) to protect up to five Android devices. Also, Lookout is a great deal for free. And of course there are other great security apps out there. PS: Is there any way you can adjust the comment field so that in case of an error (such as if the word verification has changed since we started and thus the word we input no longer works), when we go back to the comment field we still have our original comment waiting and won’t have to re-type it? I cannot find this app on the Apple App store. Could be user error but have tried it several times. Please advise! Re: Break-In Monitor for iPhone? The article notes that it’s an in-app purchase. Have you installed and opened NQ Vault and then tried to buy Break-In Monitor there? My multitasking brain didn’t catch that part. I appreciate the assist. My Galaxy S3 was stolen. I have since replaced it, keeping my original phone number. I’ve had this number for 20 yrs or so. Although this has NEVER happened before, I’m now getting text messages and phone calls from random strangers. They say they got my number when I texted them and asked them to call or text me back. I never texted them. Is it possible that whoever has my old (stolen) phone could be sending texts that show up with my phone number? Any ideas or suggestions, short of changing the number I’ve has forever? My son left his phone at his dad’s house. His nosey step mother hacked into the phone. Son went back to find Galaxy 3 screen unlocked with only swipe function. He had a 4 digit pin prior to leaving for school. The file for the “Got Ya” app (put on specifically for her) was deleted so no photos were obtainable (the email portion had not been set up)....as well as AVG and Geek Squad apps. I set the phone to default settings in case she had put spyware on the phone…which would be the only reason I can think of that the anti spyware had been deleted. When my son confronted her, the response was that he must have had an update that deleted the passcode. She ob iously thinks my so no is an idiot to believe this lame excuse. My question. ...How was the S3 able to be hacked? Thank you. My first guess is that your son’s 4 digit pin was something like his birthday, birth year or something else easily guessable by someone who knows him. Obviously, you know your son infinitely better than I. All I will say is that if in fact he did select a secure pin, he’s ahead of the game. You might be surprised what kinds of ATMs so many people pick. If this is an issue, he may want to try LastPass’ free password generator (and yes, he can also use it for numeric pins). I’m very sorry about the situation with your son’s stepmother and what she did. Good luck to you and your son!